Steel ball bearings provide smooth operation and movement. Includes a leatherette gel wrist rest. 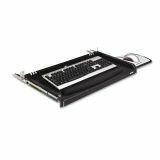 3M Under Desk Keyboard Drawer, 23w x 14d, Black - Keyboard drawer offers cushiony-soft gel wrist rest for added comfort and Precise Optical Mousing Surface. Wrist gel rest has antimicrobial protection. 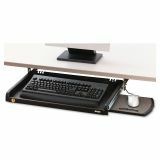 Extra-wide tray is easy to install and height adjustable. Steel ball bearings provide smooth movement. Keyboard drawer features cable management slots and a 16-1/2 track. Mousing surface can be used to the left or right of the keyboard. 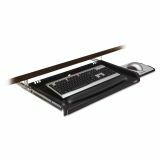 Keyboard drawer works in standard workstations." Retractable mousing pad with the 3M™ Precise™ mousing surface attaches left or right. Cable management Installation depth required: 16.5", width required: 24"